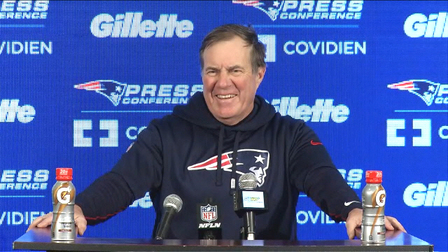 Bill Belichick has won a lot of championships – eight to be exact. In a recent interview on SiriusXM Radio, Belichick talked about the adversity and challenges his team faced this most recent season and how that made this year’s championship that much sweeter. "You know, we started off 1-2. We were 3-5 on the road, and there were just things along the way that didn't go the way that we hoped they would go. Some negativity and people counting us out, and talking about how bad we were and everything. Bad coaching, bad playing, bad everything. And then, at a point there at the end of the season, we were able to kind of play our best football in the most critical games at the most critical times in those games. And a lot of our execution was, I would say, the very best that it was all season, in some cases by quite a bit. It was very special and fulfilling for it to come together like that in spite of the adversity and other opinions. "But there was a lot of internal belief in ourselves and the process of what we were doing. Fortunately, we were able to see those results manifest themselves in some critical games at critical times. I think that, kind of, the jubilation when all that culminated in Atlanta was what you saw there from all of us." After failing to win 12-plus games for the first time since 2009, the New England Patriots pulled together when it counted the most. Belichick and his team held the Los Angeles Rams’ high-powered offense to just three points in a 13-3 victory en route to a Super Bowl LIII championship.